August 1, 1986: The Canadian Radio-television and Telecommunications Commission (CRTC) introduces the Cable Television Regulations, 1986. As a result, cable television companies have the ability to charge subscribers a special fee in relation to the cost of equipment purchased specifically to provide ‘basic cable’ service (such as coaxial cable, television antennas, signal amplifiers, satellite dishes, satellite receivers, etc.). The companies are able to increase their monthly subscriber rates by an amount that permits them to recover 50% of the cost of these capital expenditures (capex), amortized over a 5-year period. August 1987: Keith Mahar starts his corporate broadcasting career with Canadian Satellite Communications Inc., in a role requiring him to acquire knowledge of the cable television industry, CRTC and the Cable Television Regulations, 1986. 1989 – 1990: CRTC commissioners propose to stop cable television companies from charging these special capex fees for more than 5 years, which will result in basic cable rate reductions commencing in 1991, and subsequently. The companies object to this proposal and the federal regulator adopts different regulations that are more favourable to these companies. However, millions of cable television subscribers are legally entitled to monthly rate reductions by 1 January 1995, and subsequently: a total of $600 million in rate reductions over the initial five-year period. February 5, 1993: Through the Canadian Cable Television Association (CCTA), cable television companies offer to donate up to $100 million to subsidize private Canadian production companies if the CRTC changes the regulations as advocated by the CCTA, including the elimination of the legal requirement for the companies to reduce their monthly rates for basic cable service by 1 January 1995, and subsequently. June 3, 1993: The CRTC proposes to enact a highly unorthodox regulation; subsection 18(6.3) of the Cable Television Regulations, 1986. ‘Regulation 18(6.3)’ will permit cable television companies to avoid reducing their subscriber rates on 1 January 1995, and subsequently, if the regulated companies simply donate money to a fund to subsidize private television production companies. Specifically, the design of Regulation 18(6.3) will permit cable television companies to overcharge more than 6 million Canadians for cable television service starting in January 1995, siphon revenue out of the broadcasting system and cross-subsidize other commercial activities if the companies donate 50% of the otherwise required rate reductions to the production company subsidy fund (subsequently named the Cable Production Fund). In effect, Regulation 18(6.3) will grant several businessmen unprecedented power to redistribute wealth from ordinary citizens to their companies, and ultimately themselves, without the requirement of performing any work or service for the revenue; resulting in unjust corporate enrichment. Billionaire Ted Rogers appears to be the single largest beneficiary of the highly unorthodox wealth redistribution scheme. However, this information is not effectively conveyed by the CRTC to the public or potential ratepayers of the wealth redistribution scheme. September 17, 1993: Friends of Canadian Broadcasting files a scathing submission to the CRTC questioning “the Commission’s authority to impose such a tax” and describing Regulation 18(6.3) as “a breach of faith” with Canadians that will threaten public support for the CRTC and Canadian programming if properly understood by citizens. January 25, 1994: Regulation 18(6.3) is enacted by the CRTC. September 1994: Keith Mahar resigns from his position in the broadcasting industry and while appearing at a CRTC public hearing states that Canadians should be made aware of the impact of Regulation 18(6.3) on their monthly cable television rates. October 11, 1994: Cabinet issues Order-in-Council P.C. 1994-1689, making it government policy to foster fair competition and increase reliance on market forces in the provision of facilities, products and services related to communications. Regulation 18(6.3) violates this government policy, as it will permit cable television companies to overcharge cable subscribers and siphon revenue out of the broadcasting system to cross-subsidize other commercial ventures, thereby fostering unfair competition. January 1, 1995: More than 6 million Canadians start paying artificially inflated rates for basic cable television service due to Regulation 18(6.3). Since subscribers are not provided with direct written notice of the existence of Regulation 18(6.3), they remain totally ignorant that they are being required to subsidize private corporations in this unorthodox fashion. Given that subscribers were previously notified that these fees were for an entirely different purpose, the CRTC is sanctioning cable television companies to collect the Regulation 18(6.3) fees under false pretences from citizens. March 8, 1995: The Globe and Mail reports Keith Mahar’s position that Canadians are being subjected to a hidden tax agenda by the CRTC to permit cable television companies to overcharge consumers for service and cross-subsidize the development of the so-called “information highway” (the internet). March 17, 1995: The Toronto Star publishes Keith Mahar’s op-ed article, in which he identifies Regulation 18(6.3) and states that the CRTC is redistributing wealth from ordinary Canadians to privileged corporations and that an investigation into the affair is warranted. March 29, 1995: Keith Mahar conducts a Parliament Hill press conference to advocate for a review of the CRTC affair by the Chrétien government. Legal counsel Christopher K. Leafloor and Neil Milton, and MPs Simon de Jong (NDP), Jan Brown (Reform), and Dan McTeague (Liberal) also participate in the press conference. In response, the CRTC issues a press release containing false and misleading information about Regulation 18(6.3). March 30, 1995: MP Jan Brown directs questions relating to the CRTC issue to Prime Minister Jean Chrétien in the House of Commons. In response, the Hon. Sheila Finestone alleges that Parliament is unable to interfere in this CRTC affair. March 31, 1995: The Toronto Star reports that MP Dan McTeague has accused the CRTC of issuing misleading information regarding the affair and is urging an investigation of the CRTC by the Chrétien government. May 15, 1995: As a result of the failure by the Chrétien Government to act on the issue, Keith Mahar initiates a proceeding in the Ontario Court to establish the legal right of subscribers to receive written notice about Regulation 18(6.3), and their entitlement to refunds for the amount overcharged since 1 January 1995. Mr Mahar personally sues Rogers Cablesystems Ltd. in his capacity as a subscriber for the amount he has been charged under Regulation 18(6.3). May 16, 1995: CRTC officials appear as witnesses before the House of Commons Standing Committee on Canadian Heritage to provide evidence on the Main Estimates for the fiscal year ending and CRTC Chairman Keith Spicer provides false and misleading information about Regulation 18(6.3) to the parliamentary committee. July 24, 1995: The CRTC’s secretary general provides Keith Mahar with data on the exact monthly cost of Regulation 18(6.3) to ratepayers across Canada, identifying that some subscribers of Rogers Cablesystems Ltd. are being charged 57 times more under the Regulation 18(6.3) scheme than subscribers of some other cable television companies. August 25, 1995: Rogers Cablesystems Ltd.’s legal counsel files a motion seeking to stop the Ontario Court from ruling on the merits of the case, arguing that the CRTC has exclusive jurisdiction to make the decision on Keith Mahar’s legal proceeding. September 27, 1995: The Toronto Star reports the launch of Cable Watch Citizens’ Association (Cable Watch), a group founded by Keith Mahar to protect the interests of consumers, increase the public accountability of the CRTC and pursue a more democratic regulatory process. November 1995: Keith Mahar, legal counsel Christopher K. Leafloor and MP Dan McTeague hold a press conference on Parliament Hill on November 28th, where they announce that a complaint is being filed that same day by Cable Watch to the CRTC. Later that day, an official complaint by Cable Watch is submitted to the attention of CRTC Chairman Keith Spicer, pursuant to section 12 of the Broadcasting Act. The complaint alleges wrongdoing by both the companies collecting Regulation 18(6.3) without notice and also the CRTC. As a result, CRTC file 1000-121 is opened by the federal regulator. The Public Interest Advocacy Centre subsequently requests that the government “swiftly” initiate an independent review of Cable Watch’s allegations against the CRTC in relation to Regulation 18(6.3). No such review is initiated. December 1995: Keith Mahar requests that the Hon. Michel Dupuy, Minister of Canadian Heritage, the Hon. Paul Martin, Minister of Finance, and the Hon. John Manley, Minister of Industry, review the CRTC matter – none do. Later that same month, Toronto magazine NOW identifies Mr Mahar’s campaign as one of the top stories missed by the media that year. January 30, 1996: CRTC Vice-Chairman of Broadcasting Fernand Bélisle implies at a conference that the Commission has already made its decision against Cable Watch’s complaint. He states that the only way for Keith Mahar to “re-fight” Regulation 18(6.3) is to go to Federal Court. The CRTC has not notified Mr Mahar or his legal counsel that it has made its decision. March 1996: Following letters of support for a public hearing into the Cable Watch complaint by the Consumers’ Association of Canada and the Alliance of Seniors to Protect Canada’s Social Programs, the CRTC alleges in correspondence that it has not yet decided the merits of the complaint. However, the federal regulator adopts a biased process to consider the matter, as only Rogers Cablesystems Ltd., the industry lobby group CCTA and Cable Watch (which is basically Keith Mahar and his pro bono legal support) are permitted to submit information about the complaint. MP Simon de Jong subsequently issues a press release stating that Mr Mahar’s campaign is addressing important issues for consumers, industry and government, and that consumers are being denied their rights by the government. In contrast, Rogers Cablesystems Ltd. and the CCTA recommend to the CRTC that the Cable Watch complaint is without merit and should be dismissed. April 1996: Cable Watch files a submission to the CRTC maintaining that the process used to adopt Regulation 18(6.3) was unlawful; that the CRTC lacked the legal authority to adopt Regulation 18(6.3); that subscribers had a legal right to receive written notice about Regulation 18(6.3); that subscribers were legally entitled to refunds from cable television companies that had collected Regulation 18(6.3) fees without written notice; that subscribers were entitled to rate reductions for basic cable service; and that the CRTC generally does not use effective methods to notify citizens of its matters. In addition, Cable Watch requests the CRTC hold a public hearing into the matter to permit the participation of Canadians. Ten days later, CRTC officials appear before the House of Commons Standing Committee on Canadian Heritage and provide false and misleading information about the Regulation 18(6.3) affair to the parliamentary committee. MP Jim Abbott states that subscribers are “totally unaware of the cable production fund policy” and asks the CRTC representatives to commit to requiring cable television companies to notify their subscribers about Regulation 18(6.3). However, CRTC representatives decline to make such a commitment (and subscribers are never notified about the regulation). May 1996: Keith Mahar is diagnosed with bipolar disorder while experiencing severe depression. Days later, the CRTC proposes new regulations for the cable television industry, the Broadcasting Distribution Regulations. These proposed regulations seek to modify the unjust corporate enrichment scheme initiated under Regulation 18(6.3), making it even more profitable for Rogers Cablesystems Ltd. and more difficult for subscribers to identify or quantify. Cable Watch’s legal counsel Christopher K. Leafloor subsequently submits additional information to the CRTC related to the Cable Watch, including legal arguments that the CRTC and cable television companies have acted unlawfully. September 9, 1996: Deputy Prime Minister and Minister of Canadian Heritage Sheila Copps announces the establishment of a government-industry partnership with cable television companies (the corporations collecting the Regulation 18(6.3) fees without notice to millions of Canadians) to subsidize private television production companies. The Cable Production Fund is combined with an existing subsidy program operated by Canadian Heritage. The new fund is named the Canada Television and Cable Production Fund. October 15, 1996: Keith Mahar and MP McTeague appear together at a CRTC hearing and oppose the proposed Broadcasting Distribution Regulations. Mr Mahar stresses that the proposed changes related to Regulation 18(6.3) will foster greater cross-subsidization, will violate government policy and will be grossly inequitable to Canadian cable subscribers. November 14, 1996: Keith Mahar is admitted to a Toronto psychiatric hospital while experiencing acute psychosis. 1997: Keith Mahar spends the majority of 1997 in the United States, Europe and Africa. January 1998: The Broadcasting Distribution Regulations come into force on January 1st. While there is no longer a Regulation 18(6.3) in name, a modified wealth redistribution scheme is entrenched which still requires millions of cable television subscribers to subsidize private companies and violates existing government policy. 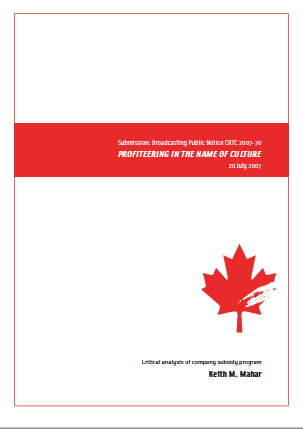 The adopted accounting system for cable television rates facilitates an increase in the unjust enrichment of selected corporations, primarily Rogers Cablesystems Ltd. Furthermore, the CRTC has also opened the door to deregulate the monthly rates for cable television in the future. Days later, Keith Mahar returns to Canada and contributes to the drafting of a private member’s bill related to the CRTC at the request of MP Dan McTeague. The same politician also commissions Mr Mahar to undertake research into reform of the federal regulator. March 18, 1998: MP Dan McTeague introduces Bill C-381 to Parliament: “The purpose of this enactment is to amend the Canadian Radio-television Telecommunications Commission Act to provide for representation of Canadian consumers on the Commission, to require reports of Commission decisions to detail the way each Commission member voted in respect of those decisions and to ensure that the Commission generally has regard to cost-effectiveness and the rights of Canadian consumers”. April – May 1998: The Canada Television and Cable Production Fund encounters controversy and it is revealed that non-repayable grants have been handed out to private production companies on a first-come, first-subsidized basis and that subsidies have been provided to prominent production companies for television series with large U.S. partners that had no Canadian storylines before supporting programming with original Canadian content. While Canadians are being required to pay for these subsidies, a significant portion of the subsidized television programs were produced primarily for foreign markets. September 17, 1998: The Canada Television and Cable Production Fund is re-branded as the Canadian Television Fund. April 19, 1999: MP Dan McTeague and Keith Mahar file a joint submission on how to reform the CRTC to the Liberal Caucus Group of the CRTC. June 10, 2000: In an article published in The National Post, Professor Matthew Fraser alleges that the CRTC has been totally captured by corporate interests since the late 1980s and is cursed by institutionalized corruption. October 22, 2000: Bill C-381 dies on the Order Paper as a result of Parliament being dissolved when Prime Minister Jean Chrétien calls an early election. October 12, 2001: Keith Mahar migrates to Australia. March 20, 2004: The National Post reports that there has been a long-standing practice of CRTC commissioners and senior staff attending private dinners, paid for by corporations regulated by the Commission, and without any minutes taken to account for the discussions with the corporate executives present. The CRTC states that no more private dinners will occur. September 6, 2004: On the 10th anniversary of ending his corporate broadcasting career, Keith Mahar submits evidence of the ongoing CRTC wealth redistribution scheme to Prime Minister Paul Martin. September 16, 2004: The Office of the Prime Minister acknowledges receipt of the submission and notifies Keith Mahar that copies of the documents have been forwarded to the Hon. Liza Frulla, Minister of Canadian Heritage; the Hon. Ralph Goodale, Minister of Finance; the Hon. David Emerson, Minister of Industry. No further action is taken by the Martin government. September 23, 2004: Friends of Canadian Broadcasting releases research it commissioned, which suggests a large number of appointments to CRTC are simply patronage appointments, and is also critical of such appointments being vested with the prime minister. January 2006: On behalf of Keith Mahar, lawyer Paul Armarego provides information on the history of the CRTC scheme and allegations of corruption to Canadian politicians Stephen Harper, Gilles Duceppe, Jack Layton and Jim Harris. Mr Armarego specifically notes the unpublished CRTC decision of 25 June 1996 in response to the Cable Watch complaint and the existence of CRTC file 1000-121. No response is received. Mr Harper subsequently unveils the Conservative Party platform (Stand Up For Canada), promising to “clean up government” and “replace a culture of entitlement and corruption with a culture of accountability.” The Conservatives win a minority government. February 6, 2006: Stephen Harper is sworn in as Canadian prime minister and appoints former CRTC Commissioner Beverley Oda as Heritage Minister. Minister Oda was a CRTC commissioner when Regulation 18(6.3) was originally proposed and possesses insider information of the wealth redistribution scheme. March 27, 2006: CRTC file 1000-121 is destroyed along with all of the documents stored in the file. January 25, 2007: Prime Minister Stephen Harper appoints Konrad W. von Finckenstein CRTC Chairman. February 14, 2007: The Toronto Star's media columnist Antonia Zerbisias notifies her editor by email that Keith Mahar has offered her an exclusive to the CRTC story and the award-winning journalist states: “This is MUCH bigger than the sponsorship scandal.” The Toronto Star does not publish a feature on the CRTC story. February 15, 2007: Lawyer Paul Armarego notifies the Chair (MP Gary Schellenberger) and Vice-Chair (MP Maka Kotto) of the House of Commons Standing Committee on Canadian Heritage of possible corruption related to the Canadian Television Fund, and requests standing for Keith Mahar to testify before the parliamentary committee. There is no response. March 16, 2007: Lawyer Paul Armarego requests standing for Keith Mahar to appear before the Standing Senate Committee on Transport and Communications, which is reviewing issues related to the Canadian Television Fund. April 5, 2007: Keith Mahar contacts CRTC Chairman Mr von Finckenstein and requests an opportunity to address the Task Force on the Canadian Television Fund. His request is denied. May 9, 2007: The Hon. Lise Bacon, Chair of the Standing Senate Committee on Transport and Communications, acknowledges Keith Mahar’s allegations of corruption and denies his request to appear before the Committee. June 29, 2007: The CRTC issues Broadcasting Public Notice CRTC 2007-70 and calls for comments on the Canadian Television Fund (CTF) Task Force Report. July 20, 2007: In response to Broadcasting Public Notice CRTC 2007-70, Keith Mahar files a submission to the CRTC. He includes copies of several documents that had been stored by the federal regulator in CRTC file 1000-121 and destroyed on 27 March 2006. A copy of the unpublished CRTC decision to the Cable Watch complaint is one of these documents. At that time, he was not aware of the destruction of CRTC file 1000-121. August 2007: Keith Mahar contacts the CRTC’s Secretary General Robert Morin and requests access to CRTC file 1000-121. In response, CRTC Legal Counsel Shari Fisher informs Mr Mahar that CRTC file 1000-121 has been destroyed. The CRTC lawyer also specifically confirms that the federal regulator made the unpublished decision of 25 June 1996 related to the Cable Watch complaint. September and October 2007: Keith Mahar requests CRTC Legal Counsel Shari Fisher to identify who authorized the destruction of CRTC file 1000-121 and also identify the date that the file was destroyed. Ms Fisher responds to Mr Mahar that CRTC file 1000-121 was destroyed on 27 March 2006, but the lawyer does identify who authorized its destruction. After Mr Mahar repeats his request for information about who authorized the destruction of CRTC file 1000-121, Ms Fisher notifies Mr Mahar that the CRTC considers his matter to be closed. The lawyer copies her email to CRTC Chairman Konrad von Finckenstein and six other bureaucrats at the federal regulator. November 5, 2007: The CRTC announces that its public hearing on the Canadian Television Fund will commence on 4 February 2008. December 2007: Keith Mahar conducts a presentation at the World Psychiatric Association International Congress in Melbourne, discussing his experience of acute psychosis while campaigning against the CRTC wealth redistribution scheme, his subsequent mental health recovery in Australia, and his intention to return to the outstanding matter in Canada. He subsequently notifies CRTC Secretary General Robert Morin of his intention to appear at the public hearing commencing on 4 February 2008. February 7, 2008: Keith Mahar meets with two officers from the Royal Canadian Mounted Police (RCMP) in Ottawa in relation to the CRTC affair. Later that day, he appears at the CRTC public hearing, provides a brief overview of the Regulation 18(6.3) issue and advocates for a judicial review of the outstanding matter. In response, CRTC Commissioner Rita Cugini alleges that the CRTC has no knowledge of the issue and states that the federal regulator does not make unpublished decisions (contradicting CRTC Legal Counsel Shari Fisher’s prior correspondence to Mr Mahar). Mr Mahar subsequently issues a press release addressing the failure of Prime Minister Stephen Harper to act on the information previously sent to him pertaining to this case of CRTC corruption, which is carried by several online news sources, including CNBC and Reuters. February 8, 2008: MP Libby Davies (Vancouver East, NDP) asks questions in the House of Commons about the failure of the Harper Government to take action on the CRTC matter, stating that Canadians are owed more than $1.2 billion. The Hon. Jim Abbott alleges that the Harper government has already referred the CRTC affair to the CRTC, misleading Parliament in the process. No further action is taken by politicians. May 2008: Keith Mahar is notified by the RCMP that the CRTC matter has been investigated, that no evidence of criminal wrongdoing has been identified, that the police force considers it to be a civil law issue and has closed its file on the matter (RCMP file 2008-457967). Mr Mahar subsequently files a complaint directly with CRTC Chairman Konrad von Finckenstein, requesting that action be taken to address Commissioner Rita Cugini’s misleading comments at the public hearing. June 2008: CRTC Senior Legal Counsel John Keogh responds to Keith Mahar on behalf of Chairman Konrad von Finckenstein. Mr Keogh acknowledges that the commission is in fact aware of the history of the issue. However, the lawyer alleges that the unpublished CRTC decision was not a decision simply because it was not assigned a decision number. Subsequently, Canada Free Press publishes an article by Mr Mahar about the CRTC affair in which he describes the method of collecting the Regulation 18(6.3) fees from Canadians as “government-regulated fraud” and the scheme as a case of “crony capitalism”. June 2010: A number of documents related to the CRTC affair are delivered to the Office of the Prime Minister, including a request from lawyer Paul Armarego to Prime Minister Stephen Harper to permit Keith Mahar to testify before the House of Commons Standing Committee on Canadian Heritage to address the long-term case of corruption involving the CRTC. A representative from the Prime Minister’s Office acknowledges receipt of the documents and informs Mr Armarego that the material has been forwarded to Tony Clement, Minister of Industry. August 25, 2010: Canadian Heritage Minister James Moore advises lawyer Paul Armarego that Mr Clement forwarded the material to him. Mr Moore recommends Keith Mahar contact a bureaucrat about testifying at the Standing Committee on Canadian Heritage, and does not assist Mr Mahar to address this matter. June 2012: Prime Minister Stephen Harper announces the appointment of Jean-Pierre Blais as CRTC chairman and Keith Mahar subsequently contacts the Clerk of the House of Commons Standing Committee on Canadian Heritage, requesting the opportunity to testify about the case of long-term corruption at the CRTC. Relevant MPs are sent copies of the email and there is no response to the request. August 2012: Keith Mahar contacts CRTC Chairman Jean-Pierre Blais directly by email to notify him of the case of CRTC corruption. Mr Mahar requests Mr Blais to provide him with information about why CRTC file 1000-121 was destroyed on 27 March 2006 and who authorized its destruction. CRTC Legal Counsel Shari Fisher responds to Mr Mahar on behalf of Mr Blais, but does not provide the information requested. In addition, Ms Fisher revokes her prior written acknowledgement to Mr Mahar that the CRTC made its unpublished decision of 25 June 1996, now alleging that no CRTC decision was made in relation to the Cable Watch complaint. Mr Mahar notifies Mr Blais that the requested information has not been provided and again requests this same information from him. Ms Fisher again responds on behalf of Mr Blais, and again does not provide the information requested. September 2012 – May 2015: Keith Mahar concludes that he has sufficient documentary evidence to publicly address both the wealth redistribution scheme and case of long-term CRTC corruption, as well as to support the position that the Harper government and current CRTC administration are trying to cover up the affair. It is his intention to provide Canadians with the opportunity to hold politicians, federal regulators and media proprietors accountable for their actions. In addition, he wants scholars to be in a position to use the well-documented case in relation to research into regulatory capture and systemic corruption. He starts researching and writing a detailed account of the matter as a case study. He also enlists the services of several individuals, including a lawyer, strategic consultant, web developer, graphic designer, and editor in order to effectively address the matter on a website (www.onemedialaw.com), including a database for interested parties to review key documents. In May 2015, his story is included in Coming Out Proud to Erase the Stigma of Mental Illness, a book edited by Professor Patrick Corrigan and two of his colleagues that is described by former U.S. First Lady Rosalynn Carter as “a seminal work that confronts stigma head on”. In his chapter, Mr Mahar states that he is going to pursue the wealth redistribution scheme to its logical conclusion. 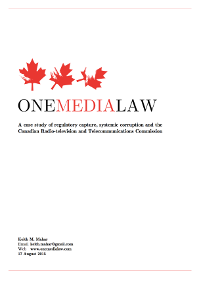 August 17, 2015: Keith Mahar completes One Media Law: A case study of regulatory capture, systemic corruption and the Canadian Radio-television and Telecommunications Commission. September 27, 2015: During Canada's federal election, Keith Mahar sends a copy of his case study into the CRTC to Prime Minister Stephen Harper and addresses his failure to stop the corruption and exploitation of Canadians. October 19, 2015: The Liberal Party of Canada wins a majority government with its leader Justin Trudeau. November 4, 2015: Justin Trudeau and his cabinet are sworn in to office. Prime Minister Trudeau issues an open letter to Canadians, promising to listen to citizens and "to set a higher bar for openeness and transparency [and] shine more light on government to make sure it remains focused on the people it was created to serve - (ordinary citizens)". He further states: "I am committed to leading an open, honest government that is accountable to Canadians, lives up to the highest ethical standards, brings our country together, and applies the utmost care and prudence in the handling of public funds" https://www.liberal.ca/prime-minister-justin-trudeaus-open-letter-to-canadians/. 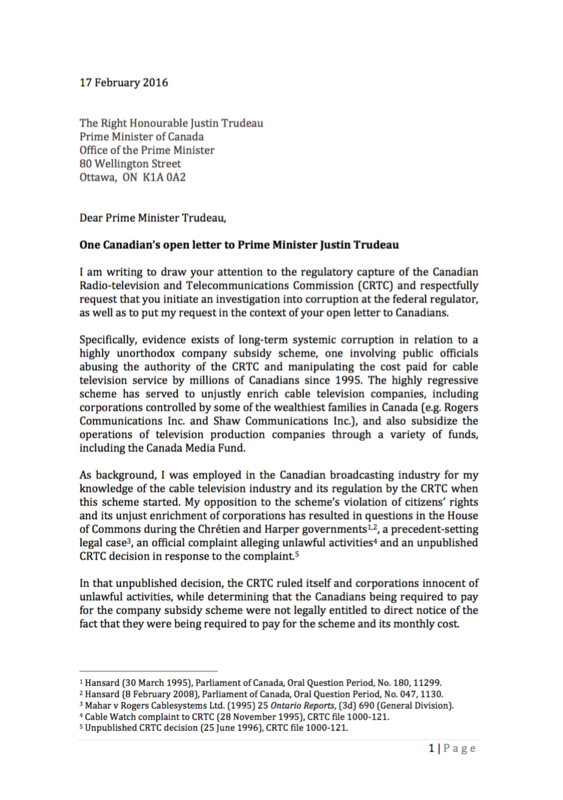 February 17, 2016: Keith Mahar sends an open letter to Prime Minister Justin Trudeau by email to address the regulatory capture of the CRTC and evidence of long-term corruption related to the company subsidy scheme. At the same time, Prime Minister Trudeau is provided with a copy of One Media Law and copies of documents formerly stored in CRTC file 1000-121, which were destroyed by the federal regulator on 27 March 2006. February 22, 2016: Fed Ex delivers documents related to the case of long-term corruption at the CRTC to the Office of the Prime Minister, to the attention of Prime Minister Justin Trudeau. The documents provided to Prime Minister Trudeau included Keith Mahar's open letter, One Media Law, Cable Watch's complaint alleging unlawful activities by the CRTC and cable television companies, Cable Watch's legal arguments supporting its allegations and the unpublished decision by the CRTC (CRTC file 1000-121). March 1, 2016: Friends of Canadian Broadcasting posts a copy of Keith Mahar's open letter to Prime Minister Justin Trudeau and a copy of One Media Law on its website: http://www.friends.ca/pub/13633. March 2, 2016: Keith Mahar notifies Prime Minister Justin Trudeau by email that Friends of Canadian Broadcasting has posted his material related to the case of CRTC corruption and offers to send more information. March 8, 2016: Keith Mahar notifies Canadian Heritage Minister Mélanie Joly of the alleged CRTC corruption by email and requests an opportunity to address the matter on the public record. No opportunity to address the matter is made available. August 6, 2018: Keith Mahar notifies CRTC chairman Ian Scott that he has notified politicians of systemic corruption at the federal agency and requests that no change be made to access the public file containing Profiteering in the Name of Culture and its appendices: (link). 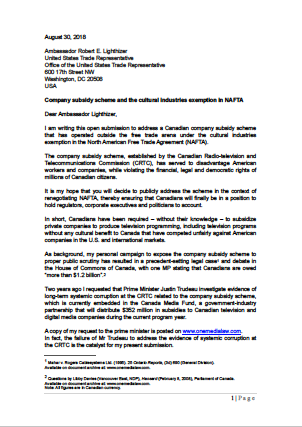 August 30, 2018: Keith Mahar files submission to U.S. Trade Representative Robert E. Lighthizer, addressing that Canada has taken unfair advantage of the cultural industries exemption in NAFTA through the company subsidy scheme embedded in the Canada Media Fund, as well as by the nature of Canadian content regulation.